When it comes to adding a decorative wreath to the wall, barbed wire may not be the first material that comes to mind for creating the perfect accent piece. While this material is often viewed as difficult to handle, a barbed wire wreath is very possible to make with the right tools and a little time. Options to add decorative floral stems to the arrangement make for a texturized final product that combines the best of dramatic edges and petal-soft lines. Creating a rustic barbed wire wreath requires collecting pliers, wire cutters, protective gloves and a hot-glue gun ahead of time. Once the materials are ready to go, finding unique ways to twist barbed wire into a careful circle makes for a professional looking final product that can be hung anywhere in the home. Feel free to mix and match floral arrangements, twine colors or base paint within the barbed wire to personalize this one-of-a-kind creation. 1. Wrap 6 feet of barbed wire into a circle allowing the meeting ends to overlap approximately 5 inches. Protective gloves should be worn to avoid cuts and scratches. 2. Twist the overlapping ends around the circle of barbed wire with pliers until they are flush with the wreath frame. 3. Attach a piece of barbed wire cut to 3 feet in length to the bottom half of the larger circle by lying it on the wreath frame and twisting the ends around the base using pliers. 4. Continue adding separate pieces of barbed wire cut to varying lengths between 2 feet and 3 feet to alternating sides of the barbed wire circle. Each piece can be attached to the top of the circular frame by twisting the ends to opposite sides of the larger circle with pliers. Add 11 pieces of barbed wire in total to achieve the required depth and texture. 5. Fold longer wire edges around the entirety of the barbed wire wreath frame down and towards the backside of the frame using pliers once all pieces have been securely attached. 6. Place the barbed wire wreath down on a large sheet of protective plastic. 7. Spray the entire surface of the wreath with vinegar using a spray bottle to apply the liquid. 8. Place the wreath on a 12x12 piece of decorative paper to protect the working surface. 9. Fill a small jar with brown acrylic paint and use a paintbrush to apply color to various portions of the barbed wire wreath in a pleasing pattern. 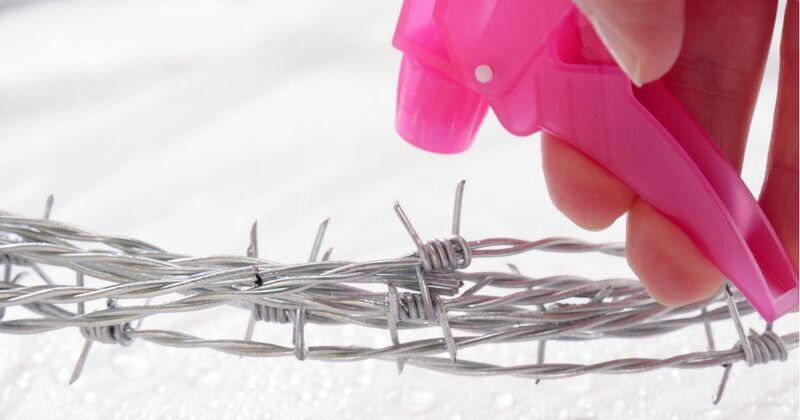 It is not necessary to cover the entire barbed wire surface with paint. 10. Once the paint is dry, place a small bunch of faux lavender stems on the bottom right corner of the wreath allowing the tips of the flowers to reach just above the halfway point of the circle. 11. Cut a piece of crafting wire with pliers approximately 4 inches in length and use it to attach the lavender stems to the wreath. Twisting the wire at the backside of the wreath is enough to secure the lavender bunch in place. Cut excess wire away as needed. 12. Attach a second bunch of lavender stems below the first, allowing for a bit of decorative overlap. Attach the second bunch with crafting wire in the same way the first bunch was secured to the wreath. 13. Repeat this process until three lavender bunches are attached to the bottom right of the wreath and three identical bunches are attached to the left side of the wreath. The ends should meet directly in the center at the bottom of the circle and pliers can be used to cut away excess material on the backside of the wreath as needed. 14. Cut away any unnecessary blossoms from the lavender bunches with traditional scissors and larger pieces of wire with wire cutters to smooth edges. 15. 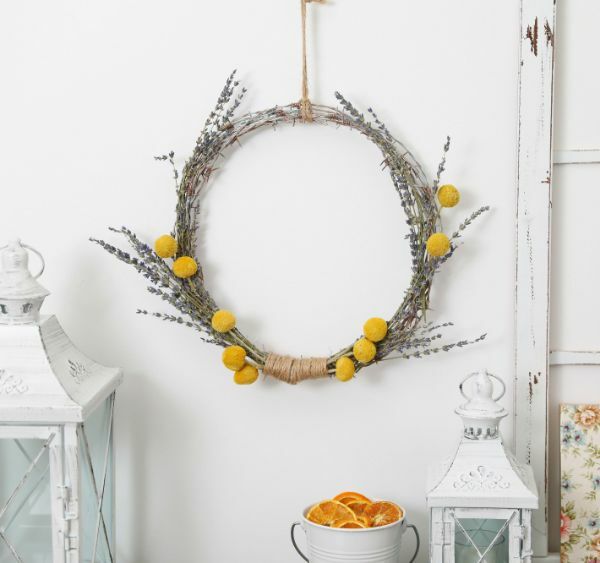 Attach 3 yellow faux puff blossoms to the bottom left of the wreath using crafting wire and use pliers to twist the wire on the backside of the wreath to secure. Repeat using 3 additional puff blossoms on the lower right side of the wreath. Cut away excess stems. 16. Cut 6 feet of twine and hot-glue one end to the backside of the wreath just below the yellow puff blossoms. 17. Wrap the twine closely until all faux stems at the bottom of the wreath are covered. Hot-glue the end of the twine to the backside of the wreath to secure. Cut away excess twine as needed. 18. Place two stems of faux yellow puff blossoms at the halfway point of the right side of the wreath using wire already in place to secure. Cut away with scissors the excess stems showing out the backside of the wreath. Repeat this process using two blossoms on the opposite side of the wreath. 19. Cut 9 inches of twine and fold the length in half around the top of the wreath to create a secure hanging loop. 20. Hang on any wall for a rustic, barbed-wired touch.